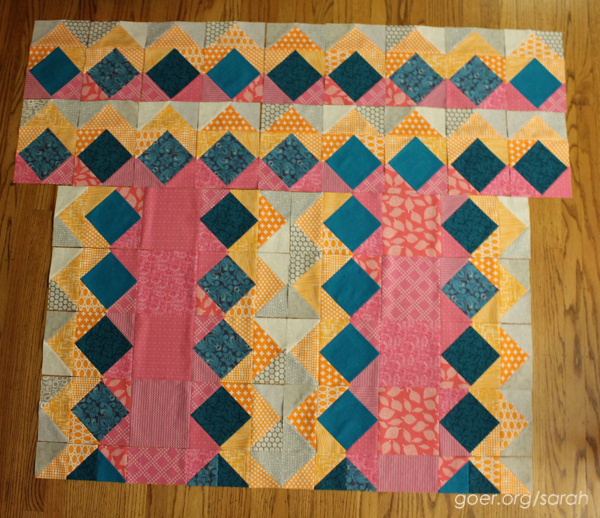 Due to an unforeseen blogging hiatus I have two months of mystery quilt sewing to share with you. 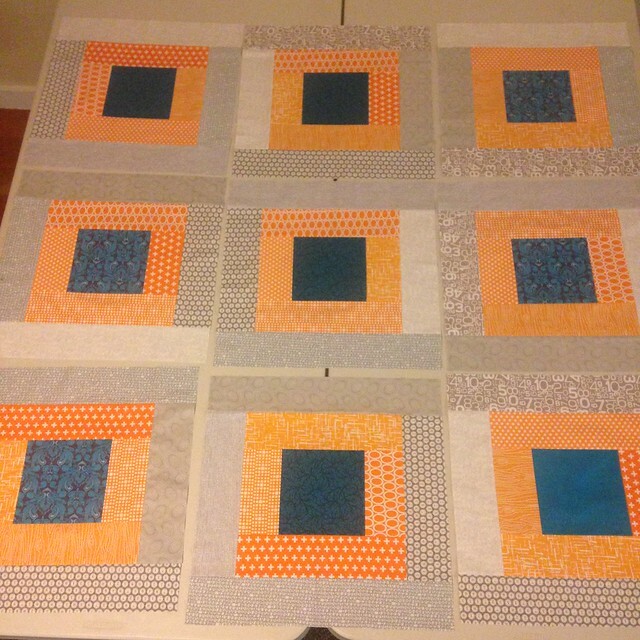 We're over halfway through the Midnight Mystery Quilt by Cheryl at Meadow Mist Designs. And as of November we've used all our pieces (I think). In October, we put together nine giant 19" Courthouse Steps units. Cheryl has said we'll be using them in December (directions will be out this Thursday). I suspect we'll be cutting them up, but I'll keep my guess of what exactly is happening to myself. This was the last bit of sewing I did on my retreat this month. In November, we put together all of the smaller units we'd made in August and September. We ended up with these 28 units. I love seeing all my scrappy fabrics together here. 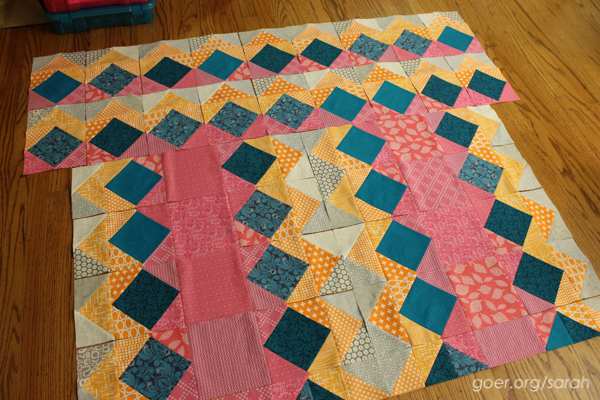 It's never too late to join in on the mystery quilt. You can find all the directions on Cheryl's blog. Posted in Quilting. Tags: lap quilt, Midnight Mystery Quilt, mystery quilt, scrappy on November 30, 2015 by sarah. Three more days and we'll know for sure... ;-) Thanks for visiting, Alison. That is my guess, too, about the large blocks. I always get excited about the newest set of instructions a few days before they are posted. :) You have done a great job with your scrappy interpretation of the colors, and it is going to be fun to see what happens next. I'm glad this month to be all caught up. There might be some higher priority sewing before I get to December's mystery quilt step later in the month, but I'm looking forward to seeing it take shape and I'm really enjoying seeing the pattern develop in all the different palettes people are using. It is all coming together really nicely Sarah! I hadn't thought too much about cutting up the big blocks, but it does make sense. I'm like you though - I have some higher sewing priorities before I get to them! Good luck with all your December sewing. Are you making gifts? Your blocks are looking great. I think we must be cutting the blocks as well. Can't wait for the instructions to see what's next. Your blocks look great! I love the colors you are using.